According to iFixIt, Apple’s much-anticipated headphones are virtually impossible to repair and are essentially unrecyclable. Apple’s AirPods are all the hype these days and wireless headphones are bound to become the norm for any smartphone in the near future. Apple’s AirPods are certainly not the first ever Bluetooth headphones, but I can’t think of any other truly portable in-ear wireless earphones that received the same amount of attention. Well, the folks over at iFixIt did what they always do and had a look inside these headphones, and I have to say, if you bought yourself a pair, don’t lose them and most importantly, don’t break them. According to iFixIt, Apple’s super-hyped headphones are virtually impossible to repair and are essentially unrecyclable. In fact, they received an abysmal score of 0 on their reparability scale. I was personally not impressed with Apple’s AirPods announcement – they looked like Apple’s regular cheap, plastic headphones, except somebody just took a pair of scissors and cut all the wires. The elongated stems awkwardly hang from your ears, and although I haven’t used them, I honestly can’t imagine their being all that useful when exercising. iFixIt’s first issue is more related with the quality of these headphones instead of their design. 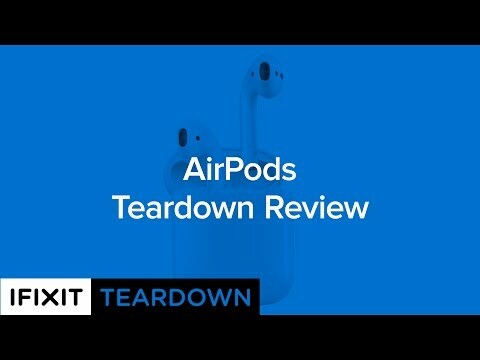 According to its X-ray imagery, there are some quality issues in the chip’s solder joints; iFixIt says, “Empty spaces, known as voiding, could be evidence of low quality standards, or a rushed product release.” Of course, given the delay the AirPods experienced, this isn’t impossible, and given the $160 price tag, none of this should be there. However, the main problem – at least for iFixIt – is the headphones’ reparability. As you can see from the video above, the team at iFixIt has to destroy the headphones in order to access the internal components. That means repairing broken out-of-warranty AirPods at home is out of the question. Not only that, glue is the only external fastener used in the earbuds – and the case – and there’s lots of it. Though glue is probably the easiest and the cheapest way to put everything together in such small casing, Apple that we are used to is all about aluminium and minimalist but sturdy screws that hold everything together. The use of glue poses an environmental concern as well: according to iFixIt, when products are glued together like Apple’s latest earbuds, recycling them costs more than what recyclers can earn from recycling, meaning most of AirPods won’t even be recycled once their life cycles are up. Have you ordered Apple’s AirPods? Does reparability matter to you? Let us know by leaving a comment below!